In our daily lives we constantly observe food waste, but rarely take these into considerations during our buying decisions. The Bühler Challenge gave us the opportunity to think in-depth about the problem of massive foodprints and the giant resource waste in the food supply chain. 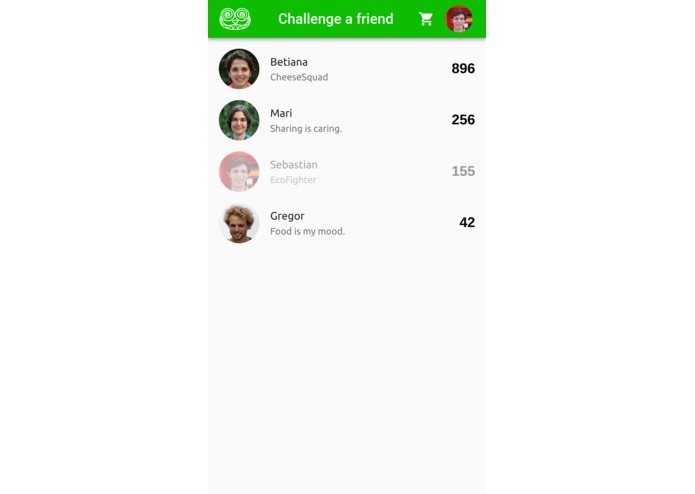 We wanted to create a solution that helps people in their daily life to make a difference, while also having fun. We met here, at HackZurich while teaming up to solve the Bühler Challenge. After considering the problem at hand, we realized that while we all had a bad conscious about it, none of us were crazy about cooking, and thus offering alternative recipes wouldn't be enough motivation. We thus considered shopping list ingredients. 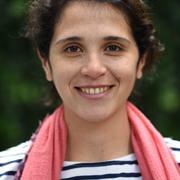 How could we then increase awareness regarding the huge foodprint of everyday products? How could we increase awareness, in people like us, who only go for basics to the supermarket? 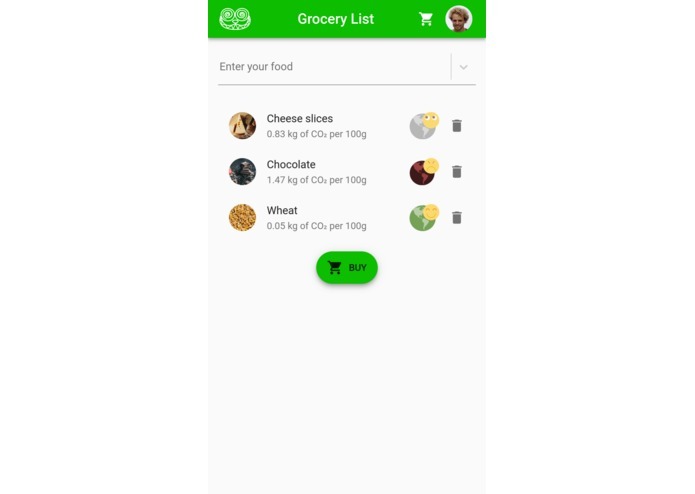 teaches the consumer to make the most sustainable grocery list: You plan your grocery list based on what you want to eat, and visualize the CO₂-equivalents for different food products. pushes the user to accomplish sustainable purchases by interaction with supermarkets, which load points into the user profile just when the customer executes a purchase. Such points are directly proportional to the real CO₂-savings. 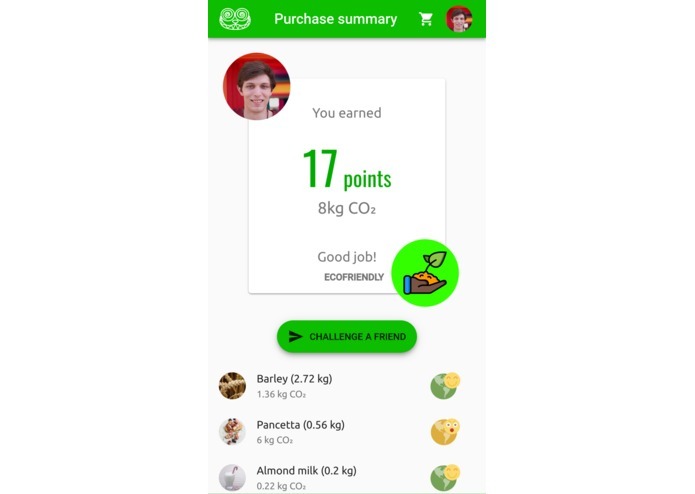 motivates the user to maintain his sustainable behavior by challenging friends to execute even more sustainable purchases while keeping social rankings based on the foodprint awareness of the users. 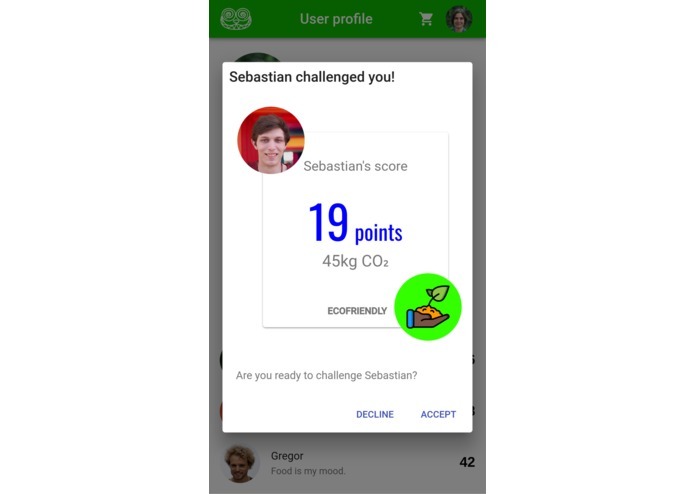 Identify behavior change motivation: The aim of the application was to come up with a concept that presented the consumer with the correct motivation to change their food consumption behavior. 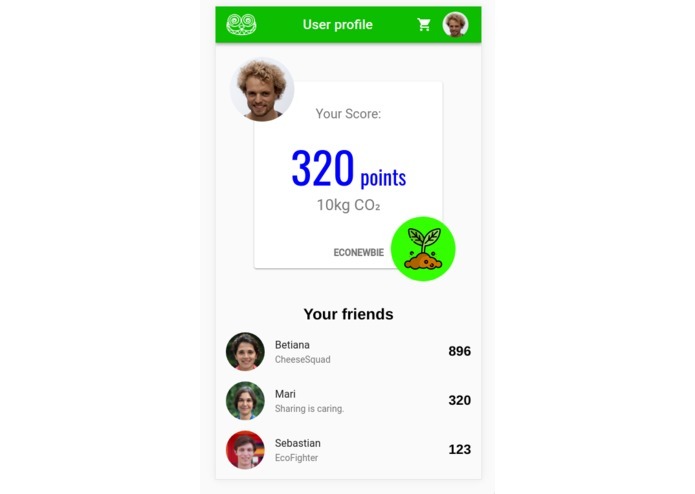 In order to do this we introduced a social aspect into the app, and transformed it into a game, where you can challenge your friends in who saves the most CO₂. 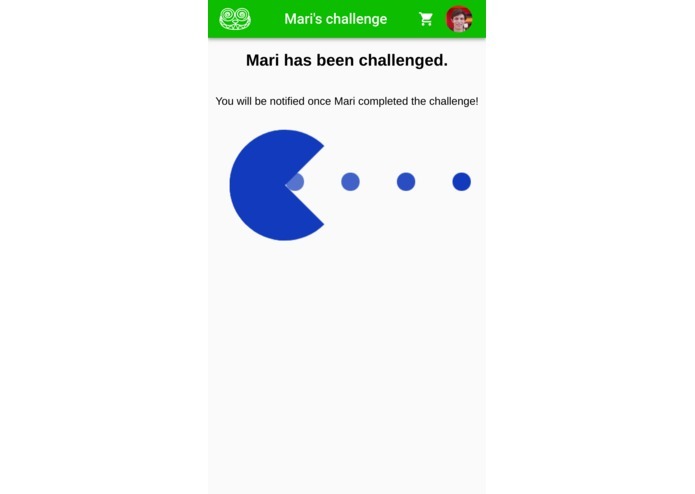 Validation of behavior change: Just making a game that the user would soon forget about, wouldn't achieve the foodprint reduction goal. Furthermore, it was necessary to ensure that the products selected in the app were actually bought in real life, in order to avoid point manipulation. We solved that by introducing a third party, the supermarket, which validates the purchase list after the items were selected. For the purpose of the hackathon we simulated a Supermarket API, but in a real world implementation big supermarket chains would proof important partner. CO₂savings reference value: Defining exactly how our game points and CO₂ savings were calculated proofed a challenge due to the fact that is hard to ensure that this purchase actually is a saving. So what do we measure? Absolute CO₂ emissions? Normalized total emissions? After discussions and data research, we decided to go for CO₂-savings. These were calculated by measuring the CO₂ emissions per 100g of "basket" (=total mass of products in the shopping cart), and calculating the difference against a reference value. As a first approach of reference, we took the average of CO₂-emissions per 100g of the average German food basket, based on data from EU documents and research publications. The team: Although we come from different backgrounds and cultures, we managed to build an awesome team, empowering the different skills brought by each of us. It would be great to test EatWise with supermarkets. 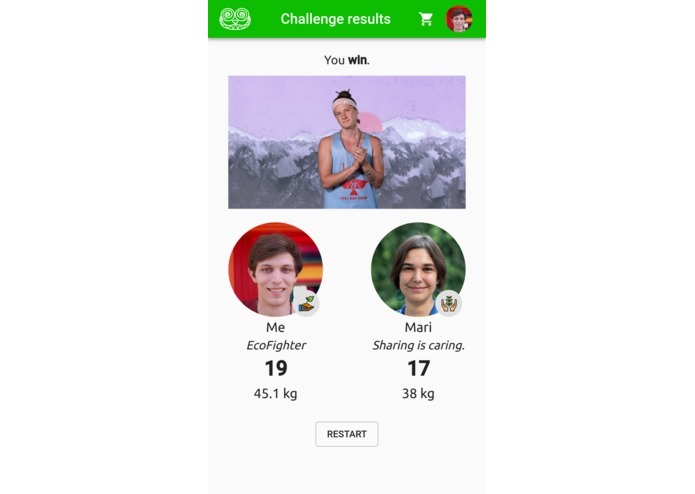 Social experiments: Is the rewarding and validations system of EatWise really prompting a sustainable behavior?